The further back in time, the prehistoric animals are rare, most unique and peculiar to our eyes. First adjustments, tests and experiments of evolution that is distributed andbranches, people still just a piece of a twig of the tree .... or less.500 million years ago during the Cambrian, appeared in the seas and oceans a trulystrange, like a squid but with teeth, larger body and gills was easier to pick up oxygen from the water and move faster. This is the Hurdia Victoria. Anomalocaris close relative to similar in many respects. The Hurdia Victoria was a top predator of its time, ate many species with basic anatomical models and dominated the seas and oceans and the creatures of their time. Keep in mind that during his appearance was the Cambrian Explosion and manynew species were appearing and taking their first steps on dangerous waters and old. And how was the Hurdia Victoria? Well, this prehistoric animal that is considered an ancestor of the arthropods, the large group that includes insects, crustaceans, spiders,millipedes and Chilopoda; could measure about 50 cm, which is giant compared tomost animals at the time. His head had a couple of thorny claws (appendices), which helped carry food to hismouth, like a slice of pineapple. He had a hole in the pointy bump on the front of hishead, although the function of this organ remains unknown, since no protection couldhave been because there is underlying soft tissue. He lobes along the sides of the trunk, which were suspended large gills. Predator and scavenger (supposedly) is considered by experts as the TyrannosaurusRex of the Cambrian. 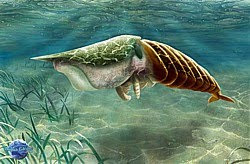 Etiquetas: Anomalocaris., Cambrian., Hurdia Victoria., prehistoric animals., prehistoricanimal. Cambrium... a amazing period with amazing creatures! Any pictures of the actual fossils? What animal are you looking for? Hyena giant or Pachycrocuta Brevirostris. Daeodon. Pig or boar terrible. 1. Homo habilis. 2 Homo sapiens. 3 H. Floresiensis (Hobit). 4 H. erectus. 5. Paranthropus ( Nutcracker man). 6 H. Heidelbergensis (Goliath). 7 H. Neanderthalensis (Neanderthal).